Hey, it's all good. Really. Like the man said, there's no crying in baseball. There's no hurt feelings. I like this online tool. I think it's great. You provide facts, quantifiable information, and benchmark experience. I didn't come here for a group hug, I asked for candid feedback and I got it. Thank you. AFAIK the comments have all been constructive. Forum members pointing out imbalances and vulnerabilities in the system I described is a bonus. For example, pointing out that the HF panels wouldn't be able to do much more than float charge the batteries (much less recover from modest battery use) was correct. I agree. I did not mention that I generator charged them back after use. I am grateful I was warned about potential dangers to the battery bank if left to the PV system I described. This is great. You folks are building my technical argument for me. When I go to do epic battle with the pit bull that controls my farm budget, I will have all my leverage data and justification handy. I'm excited and proud to get a Real charge controller, the Rogue MPT-3024. This thread's research and analysis sold me. The data logging feature is like candy for me. It's going to be a great generator of financial justification data to drive my argument for a couple of 24V 100+ watt PV panels in the next 30 days, hopefully to be followed by more after I can demonstrate the improvement in power generation and storage. It's all part of the pyramid of my solar equipment acquisition scheme. The HF kit was a starting point. Easy to get past the purse strings pit bull. Start cheap. Earn credibility. Then hammer the purse strings for a component at a time until you assemble components enough for a Real system. Before July, I want to have Real PV panels on my barn. Thanks to this bunch for helping me see the way there and justify it to Moneypenny. Some day, in an appropriate thread, I'd love to hear how some of you have schemed your way into justifying that next shiny addition to your systems. There's bound to be great stories of tactics, subterfuge, diplomacy, and titan clashes to be heard. For my accountant (aka spouse)--All I had to do was point to California (my state, ) and what happened in 2000 when "de-regulation" (aka a whole bunch of different regulations) totally messed up our energy market (a few blackouts, utilities going bankrupt, electrical costs heading up towards $0.60-$0.75 per kWH--where we are now with "peak tier/TOU pricing"). Plans to get some sort of electric vehicle when (if?) they become practical--and she was on-board. We choose Grid Tied (practical and cost effective if you already have utility power). We are down to $5.50 per month power bills and have a $300 a year credit that will go to electric car charging and/or A/C use with global warming:roll:. But, we already spent a lot of work on conservation and insulation. Before you put money in solar power--look at every place you use power/fuel and figure out if there is anything that can be done to reduce use. You will almost always have a better return on investment than spending on Solar / RE power (cheaper to conserve a watt than to generate a watt). One could argue that solar equipment and battery prices are at a low point right now--and tax rebates/credits are at a high... Both are probably going in the "wrong" direction in the future (take that forecast with a grain of salt). Conservation rules in cost benefit. I received my Rogue MPT-3024 controller this week. It arrived in excellent condition, having been carefully packed with double boxing and an abundance of packing peanuts. The unit is aesthetically a fine looking piece of equipment. It feels solid. I'm anxious to put it into actual service once I get my panels! Must being going well. I thought forum rules required all new products to be placed in the Skeptics, Hype, & Scams forum and ridiculed without consideration of merit. Well I can say on this end it is rock solid I have been running one for around year with no glitches at all. It does all it was designed to do and just flat works. it is not a rule as there have been many products mentioned in many parts of the forum that aren't up there first. furthermore, the rogue has proven itself to many here and need not be placed up there just because it is new to you. it is best for some solar products to be put up there initially though until we know more about them. for the record-just because something is in the main part of the forum does not always mean or constitute a valid product and the reverse is also true in that something in the skeptics area does not always mean that it is not a valid product. All's going well here. I'm getting close to having sold 200 of the 3024, and have been busy working on a new design. I don't think this thread was ever in the Skeptics, Hype and Scams category, but it did go through trial by fire at the beginning . WOW that is a lotta units ! Congratulations. Looks like a very nice product, and obviously fills a market niche nicely. 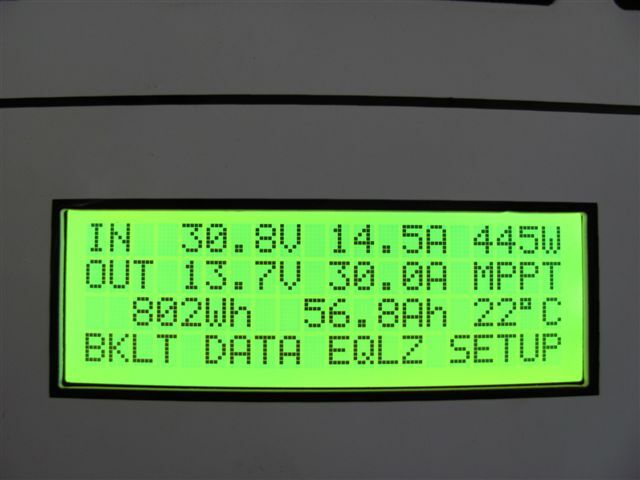 Off Grid - Two systems -- 4 SW+ 5548 Inverters, Surrette 4KS25 1280 AH [email protected], 11.1 KW STC PV, 4X MidNite Classic 150 w/ WBjrs, Beta KID on S-530s, MX-60s, MN Bkrs/Boxes. 25 KVA Polyphase Kubota diesel, Honda Eu6500isa, Eu3000is-es, Eu2000, Eu1000 gensets. Thanks Wind-Sun for this great Forum. Congrats. I think you positioned the 3024 well. Congratulations Marc! Hope that all continues well for you, your product, and your family. ditto from me. how's the hv and high current models coming along? Thanks for the support, guys. Niel, I've been working on revamping the current design to add features that people have been asking for, so I haven't done much with a higher capacity model yet...should be able to start on it in the fall or winter. sounds like things are ticking along,, let me know when you are ready to beta test the next gen! Mine has been working for nearly a year now with beautiful results! I have also had mine running for a bit more than a year and it is working fantastic for the 300 watts of solar panels and 440 A-H of battery capacity. Great product that fit the bill for our remote cabin. My unit is working fine! But what new features are you adding? The curious want to know ! I just ran across this link ... but I am sure you know about it. to 490w and I'm watching in absolute awe, getting at times 30a out. the extensive reviews here, I am confident that it will indeed handle it. Do to this report I have Just ordered this unit for my setup !! Mark - I'm trying to find a solution for many of my customers that desire to add on some battery backed capability to their existing grid-tied systems. Of course, the rub is down-converting the up to 500Vdc array so that the array power can be utilized during outages to feed a battery backed inverter. It wouldn't have to handle the whole array probably just one string. People don't want to spent the $8k to set up a Sunny Island even if they do have an SMA inverter. After spending big bucks on their grid-tie system - they feel insulted to be down during an outage. I know a high voltage charge controller is going to be less efficient and more expensive but would allow running a cheap modified-sine off-grid inverter without rewiring the array when the time came. Is there a fundamental problem doing this? The only product I can find on the web is a dubious Taiwan made unit called Hamak. If you want help developing something like this, give me a call. A couple of days ago, with temps in the high teens C, near 70F I was getting a consistent 380 watts out of my 420 net watt system. The highest peak out put was 408 watts, at just barely under 30 amps. It really is cool to watch how well this unit converts higher voltage Panel voltage to lower battery voltage. Just for fun sometimes I will load by batteries with everything I can once in a while just to drop the battery voltage as low as possible to see the highest mppt conversion just for grins. I am routinely putting ~1.5-1.8 kw into (or getting out of!) my system as the fall days are cool and the sun still reasonably high. Still very impressed with the controller! This controller is working out very well for me here. Runs at 30A 24V most any sunny day. I wish it was a tad bit larger but for what it is the thing is great. I'm trying to decide if I should get a second one to reclaim some of my lost PV power (~210W) or upsize to the Morningstar 45A model. This thing is built like a tank I feel. If you like the Rogue, (and you have excess PV), why not a pair of Rogues,,, which would give you 60 amps?,,, lots of room to grow. Yes I'm leaning that way I think. The redundancy of two is appealing to me as well. In the future I expect to complete a cabin in Vermont and two would allow me to split the system between home and cabin if I ran out of dough. My initial thought (reason) for supplying excess PV power was to maximize performance on an otherwise less than optimal day. Having teethed on this system for a while I see the error in my logic amounting to wasted wattage on perfect days. Thanks Tony, I think I will get a second one. Thanks to this thread and the other research I have done I have purchased a Rogue MPT-3024 off ebay. It was obvious from my research that my site (with some shade) was going to benefit from a MPPT controller and I have been aware of the Rogue for a while but have been a little leery because of how new is. I have 2- 90 watt panels and this controller will give me room to grow, up until now I have been using an EP solar/light controller (which I'll continue to use with my 20 watt panels for specific lighting needs) so the Rogue MPT-3024 should have a noticeable effect on my solar harvesting. I just wanted to take a moment to thank those of you who have contributed to this thread and to the Host of this forum for it's service to the community! Another happy user of the Rogue here for about 8 months. Can't wait to see the next version! As well as this version works you will not be disappointed. Seems there is a similarly named company in solar. I just ordered one today, perhaps I'll be the 200th customer! I just stumbled on to this controller as I have been looking for a 30 amp controller for a while but not satisified with what was available. I am not happy with my Xtrx C35. I like it's adjustability and other features but am not happy with only getting 2/3 of my panel potential. you'll find mppt to be great as i believe you'll like it. just keep your c35 as a backup controller or sell it if you like. should you elect to sell it you can offer it up here on the forum for sale in a separate thread with a price and other general info you feel a prospective buyer would need to know such as its age and if it comes with a temp sensor for example, but keep things like dickering or addresses and phone numbers on the private side.